Our 2018 Raffle Quilt is ready to make its debut at the Mid-Atlantic Quilt Festival in February. Come see this beauty in person, and get your tickets! Fabric: Alison Glass. 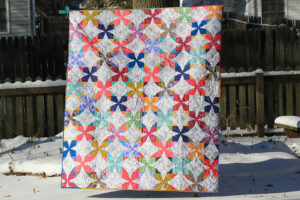 Pattern: "Wanta Fanta" by Janice Ryan at Better Off Thread.